These intrepid gentlemen visited some very remote spots; where transport and travel were difficult to say the least. A vivid picture is drawn, of one of these excursions in Cornwall. Here a Mr G.B. 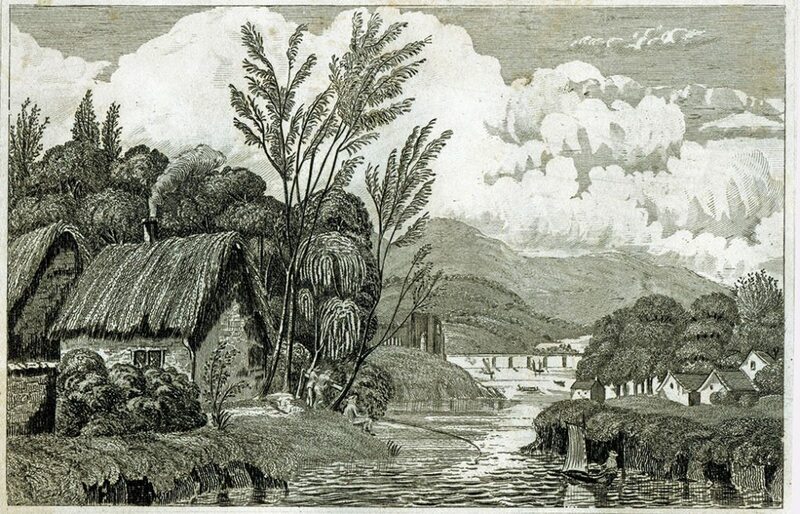 Morgan reported that: ‘wheaten thatch on houses large and small is common’. But: ‘I had occasion often during my survey, to take shelter in some of these miserable dwellings and found the poor inhabitants busy placing their bowls, crocks and pans to catch the waters pouring in at the roof’. One can imagine Mr Morgan, gazing out through the window, at his horse dripping in the yard. Hoping the rain will stop before nightfall, and he can then gain the comfort of some nearby inn. What the reporters saw… The period, in which the reports were published, also saw many amateur and professional artists roaming Britain. 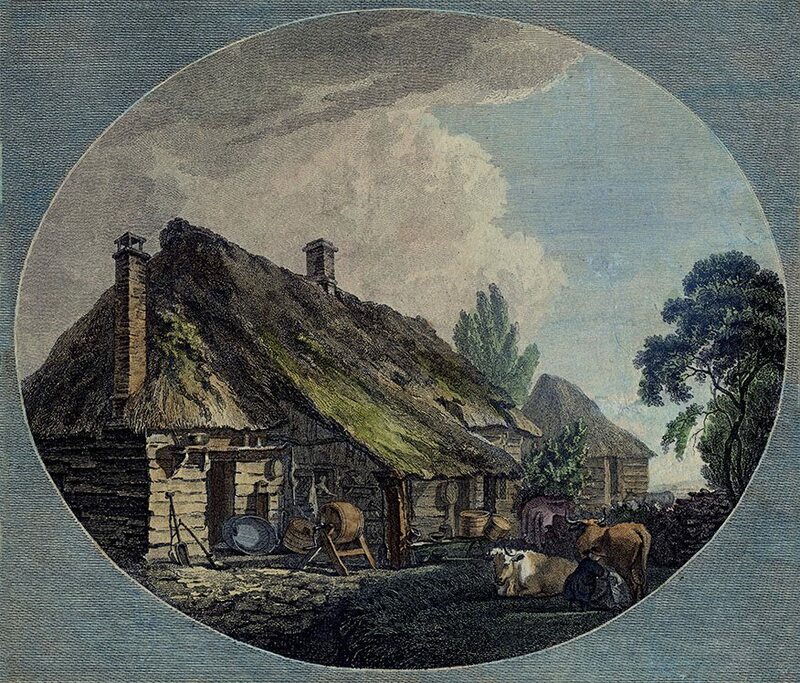 Many producing quite detailed images, of thatched roofs. Allowing us to see, the world of the reporters, through contemporary eyes. 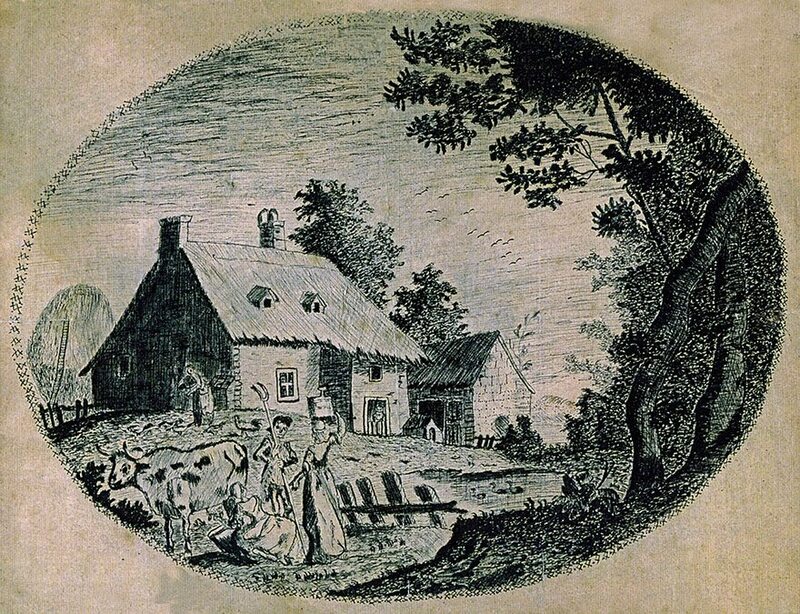 The upper print, from 1790, shows a roof romantically untidy, on a weather boarded farmhouse, probably in Kent or Essex. One Sarah Williamson, created the lower ink drawing in 1779. This is also of an unknown location; complete with a large rick and long ladder, in the background. The lack of overhang, on the gabled ends, hints at a location in Wales or the North. The author of this 1794 report, a Mr Billingsley, also raises the issue of money. The local thatchers received three shillings a square, for new work and two for recoating. Repairwork, was at a rate of 4d; for every one of the large sheaves used. These seem to have been double the size, of the standard twenty eight pound (12.5kg) ‘nitch’, then popular in most of the West Country. 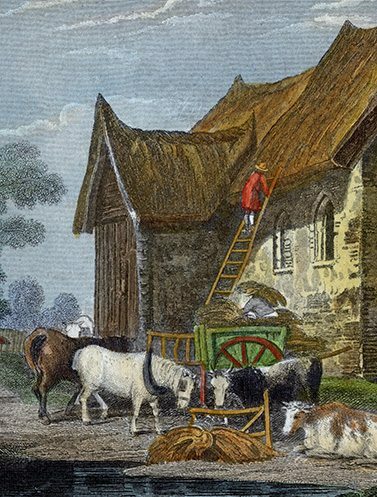 A rare glimpse… Of two Essex thatchers at work, in the early nineteenth century. It is very unusual, for the craft of thatching to appear in artwork, of this and later ages. The thatchers here are working at Coggeshall Abbey, on a medieval chapel, that became a barn. The artist has shown some typical East Anglian details, in the pointed ridge ends. 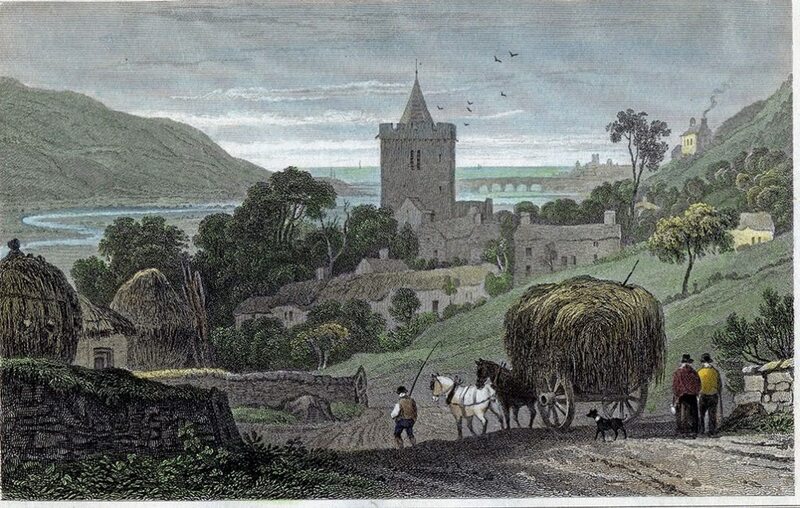 Out West…The left print is of ‘The Parsonage at Lynton’. Showing a typical curved Devon thatch. 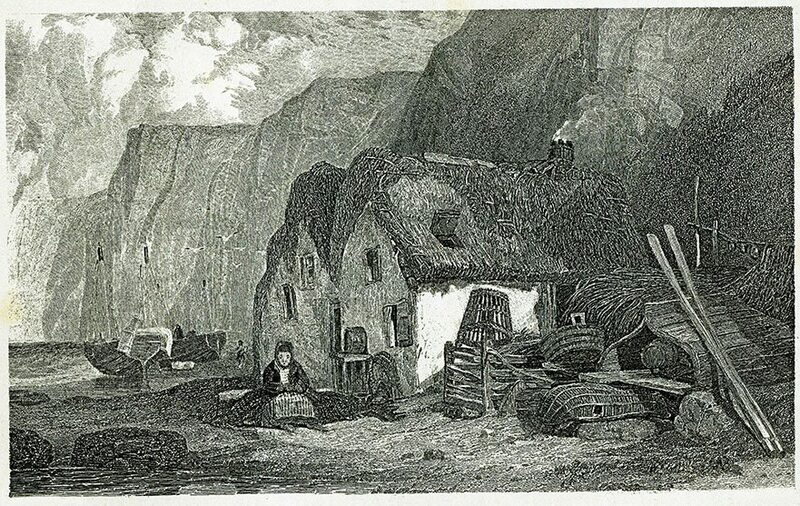 The upper pencil drawing, depicts a ‘Gloucestershire Cottage’, with a squarer roof of long straw. Signed, by a ‘Miss Jordan’ from Cheltenham. 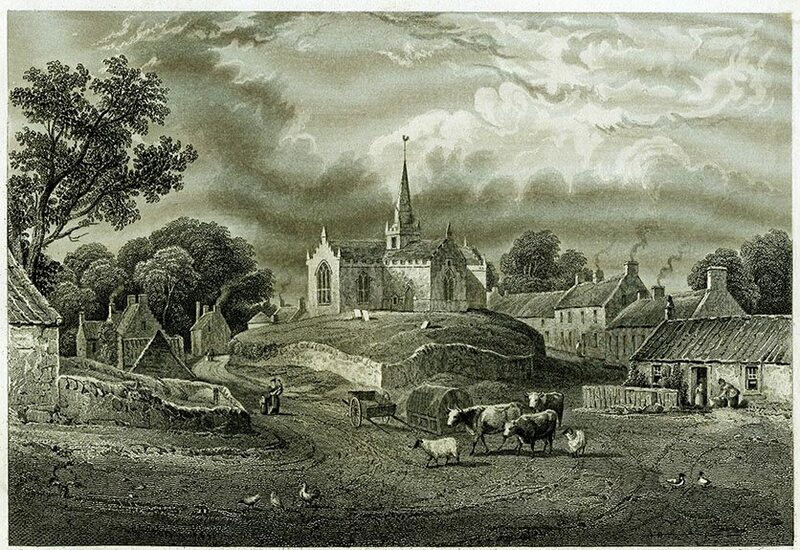 In Scotland, the reports coincided with the Improvements; then being carried out by many landowners and gentry. 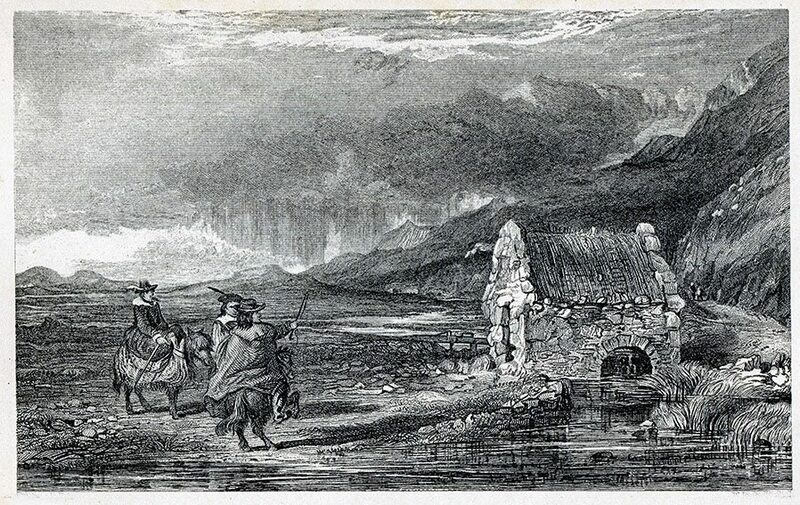 These included depopulating much of the Highlands, in the infamous Clearances… Where thatch did survive, this often meant replacing traditional roped roofs, with standard thatching methods. Until then, most thatching here had been done by the cottager, or, by bartering time, by the neighbours. 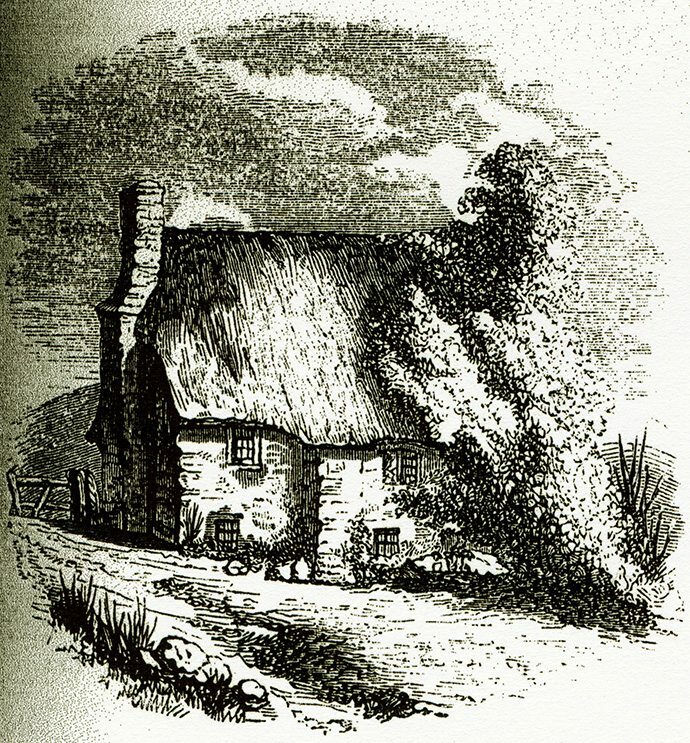 Now thatching paid… To thatch a roof, using the stobbing method; then cover the roof with clay, cost six shillings a rood, with all materials supplied. So noted Sir John Sinclair in 1795. He was covering ‘The Northern Counties and Islands of Scotland’; not the easiest report to compile. A Mr Henderson did it again, in 1812. He noted mostly traditional roofing; the thatch, being fixed by heather and straw ropes. Showing that the ‘new’ methods had a windy, climatic limit. Windy limit… This print of a water mill, on Shetland, shows some roped thatching. Confirming Mr Henderson’s report, of 1812. But further south, stobbing became very popular. In Banffshire it was known as ‘Tippeting’. The reporter noted, that to cover a layer of thatch, a yard wide (0.9m). Around eight handfuls of straw, called ‘Grips’ or ‘Tippets’, would be needed. All pushed into the old coatwork, with a forked ‘Stob’ . A Rood… An old measurement, consisting of 17¼ feet, squared; equalling 297 sq ft. (27.6 sq m). Or just under three squares of thatching. The worthy secretary also mentions the cost building a Lincolnshire house. 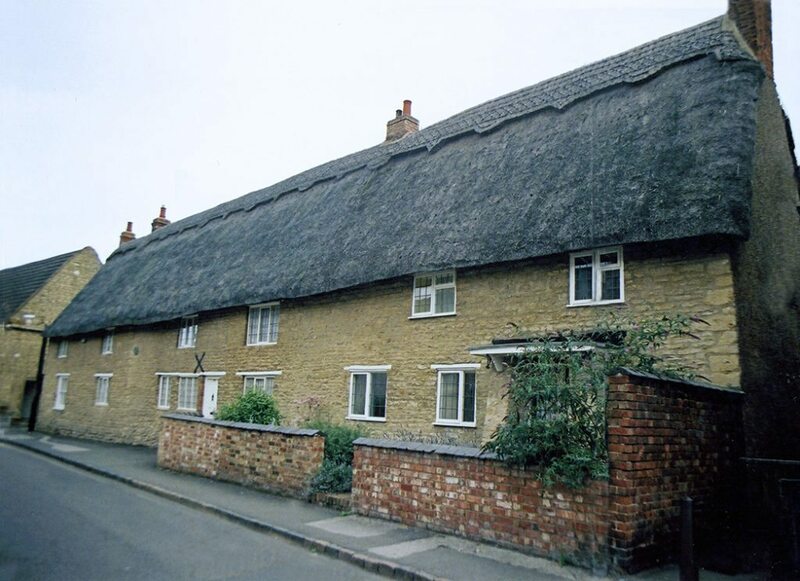 ‘About Reevesby… The old buildings are of timber, walled with clay, covered with reed; some with wheat and rye straw, which when new, will cost one third less than brick and tile.’ He gives the costs of a tiled cottage for two families, at eighty guineas (£84). An ‘improved’ cottage, up in Kincardineshire; built of ‘stone and lime’, cost around twenty five pounds. The cost including either a slate or a stobthatched roof. But a traditional thatched home, of ‘turf and stone’, cost only fifty shillings… A tenth of the cost. 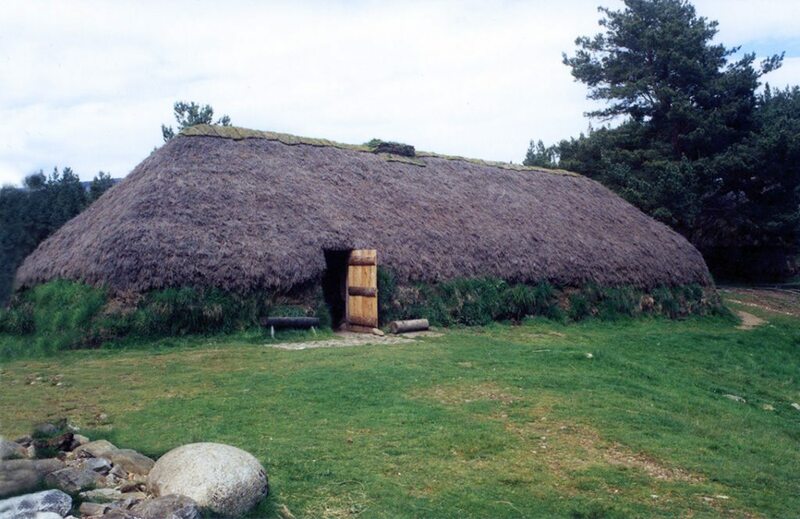 Turf and stone… Thatched with heather, and finished, with a turf ridge. It seems fifty shillings, would have purchased a much bigger version, of the small shieding, above. More like the right hand, heather thatched cottage; with walls purely of turf. Whole communities, of such buildings, were swept away in The Clearances. 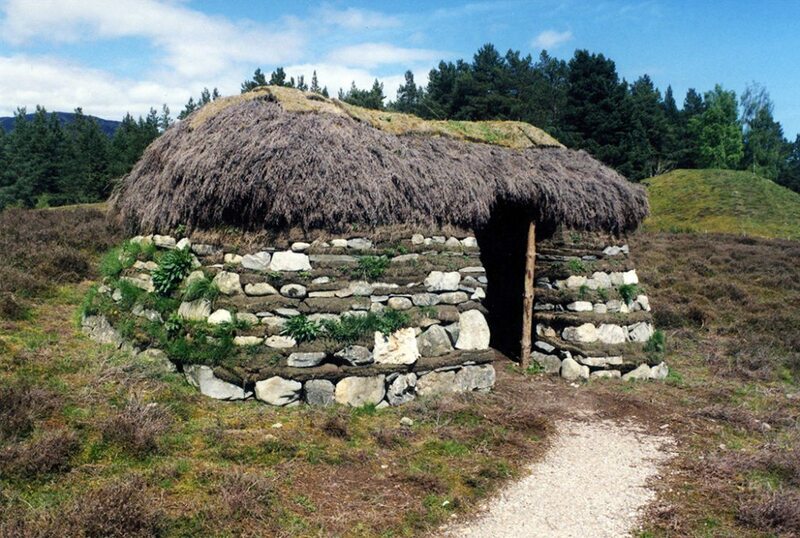 Photos; courtesy Highland Folk Museum. The agreed sum, these worthies from the ‘Houses of Industry’, could feed an inmate on, was 18d a day; this did not include accommodation. So Georgian thatchers did not have a great deal of spare cash; if only being paid by the day. Being paid by the square was probably a little better. Mr Kent concluded, that as long as the worker did not have more than a couple of offspring all would be well. No doubt an industrious wife, also made a world of difference. Finally… A few more old images from the age of the Georgian Reporters. Blyth, in Northumberland. 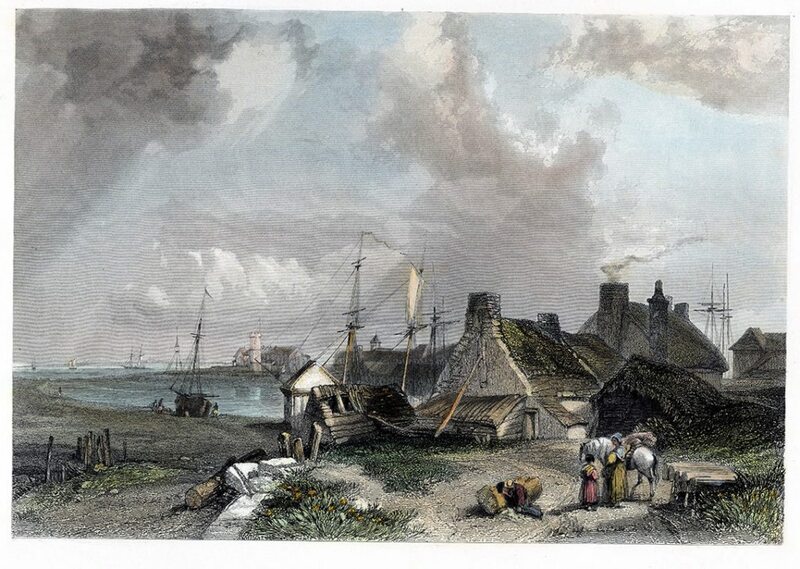 Then a busy fishing and coal port, with thatched dwellings near the sea; almost certainly covered with heather. That being the favoured thatching material, in this area. 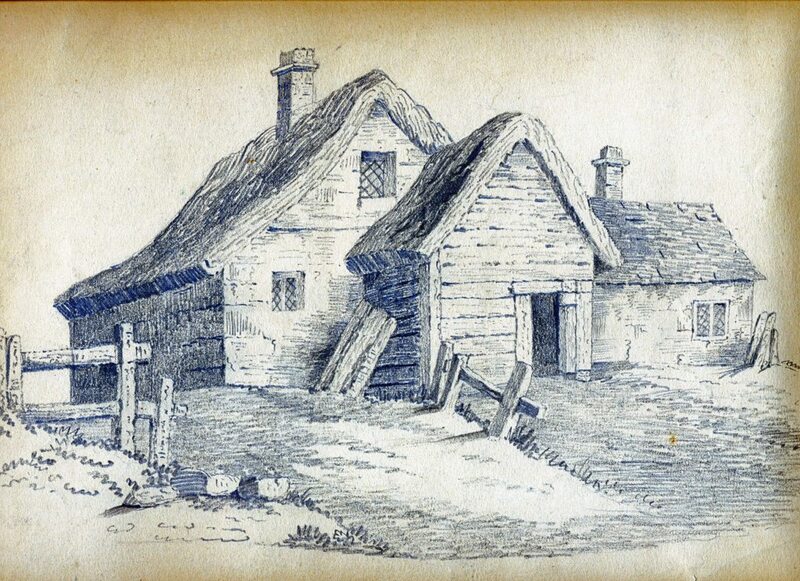 The artist has also shown masonry gabled ends, to the thatched roofs. Another local feature. The town centre, of Chipping Barnet in Hertfordshire. Over a hundred and fifty, horse drawn coaches a day, passed through here. Coming and going to London, along the Great North Road. 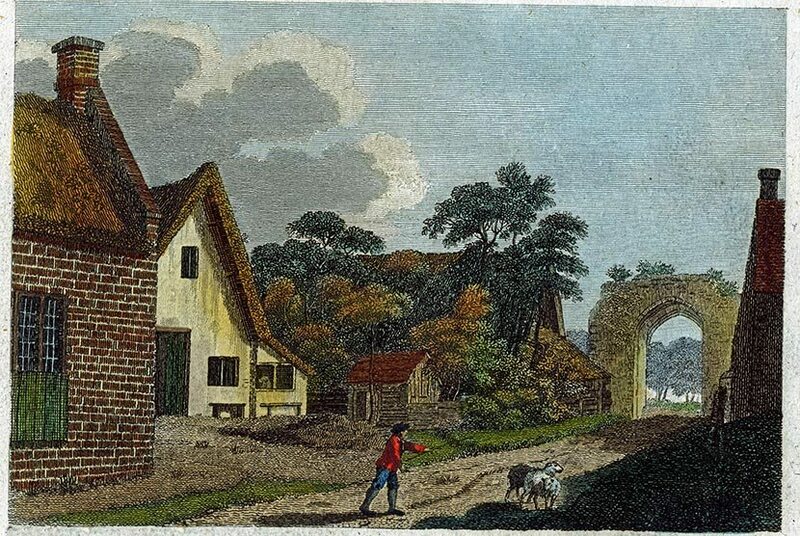 Passing close by, the thatched basket makers shop; situated on the right of this print, published in 1805. 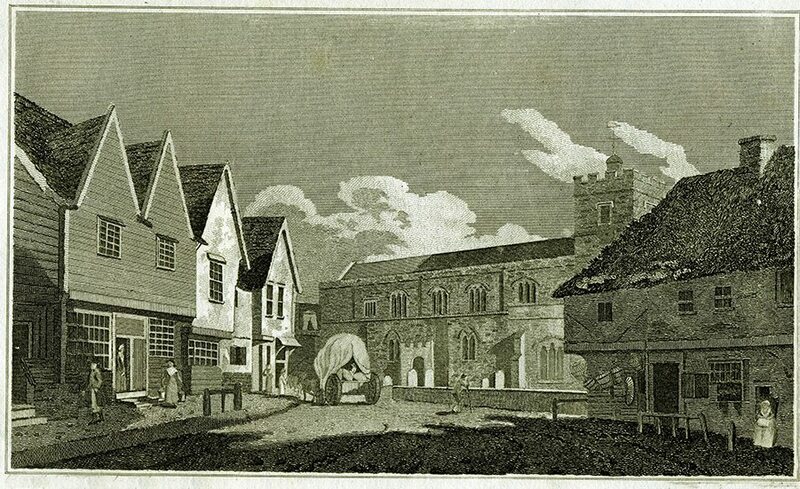 A quieter street, in 1784; at Castle Acre in Norfolk. The cottages on the left, seem to have a sharp angled thatch of water reed. Hinting that this material was transported a fair distance inland, well over two centuries ago. The reeds probably coming off marshes, near Kings Lynn, over a dozen miles away. Looking down the River Rheidol, towards Aberystwyth. At Llanbadarn Fawr in Cardiganshire. A row of thatched cottages, lie in the middle distance. And another load of hay is heading for the rickyard. The bonneted head of a woman, is just visible, on the extreme left. The artist has shown her, atop one of the growing hay ricks. With a roped and weighted, completed specimen, in front of her. 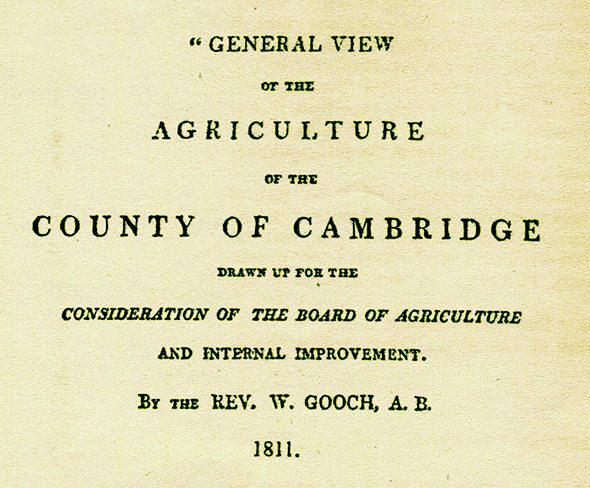 Many more enlightening comments, by the intrepid Georgian reporters, are often used as a guide, in the section, on the craft found in the various counties of Britain… One of the best descriptions of the Georgian trade, appears when the county of Glamorgan is examined… in this page; Thatching in Glamorgan.